I didn’t go to culinary school. My experience with cooking isn’t that long either. So I like to pick the brains of the chefs I have the opportunity to work with so I can expand my knowledge of cooking. Maybe you know these tips and tricks already–yay you!–but who knows, maybe you’ll learn a thing or two. Have you ever tried freezing vegetables whole or cutting them up, tossing them in a Baggie, and throwing said Baggie in the freezer? It’s not pretty. I didn’t know that the reason they become slimy and mushy when you use them later is because the veggies’ cell structure explodes from the water expanding from the freezing process. Huh. Makes sense when you think about it! Apparently, in order to freeze vegetables, you need to blanch them first. You can do this with whole veggies if they are small or cut them up. To blanch, submerge veggies (with tongs or mesh strainer) into boiling water for a few seconds. Then remove them and dunk into ice water. When the vegetables are cool enough to touch, gently squeeze out any excess water and dry well. Now they are ready to freeze. This method works for herbs too. FYI, basil turns black when you freeze it without blanching it first, yuck! In order not to end up with a big frozen block of vegetables, use what chefs call the I.Q.F. (Individual Quick Freeze) technique. This means you freeze the veggies on a baking sheet or similar surface in a single layer before putting them in the container or bag for storage. Ever feel guilty for tossing mushroom stems? Maybe it’s just me, but I don’t like to waste anything. I was let in on a secret for utilizing those undesirable and tough stubs on some varieties of mushrooms…grinding them into powder! It’s a great way to add the flavor of mushrooms to dishes, like risotto, in a pinch. Scatter stems on a wire rack above a baking sheet–you want the air to circulate underneath–and bake in the oven at 150°F-175°F until dried out. Let cool and grind mushroom stems in a spice grinder until they become powder. Store the powder in a mason jar until needed. Depending on the variety of mushroom you use, 1 Tablespoon of powder is equal to approximately 4 mushrooms. You can also dry out whole mushrooms using the same technique–but don’t grind them–and reconstitute them later for cooking. I would probably do this if I wanted to stock up on fancy mushrooms I found at a great price. Cutting celery into those perfect little uniform pieces like the pros do isn’t a product of magic, as I previously thought. Here’s how to do it: Chop off the leaves and the branches (use them for something else if you wish) and the white bottom part. Lay the rib of celery so the edges are facing down. Flatten the celery by pressing down on the flat end of a chef’s knife with the palm of your non-cutting hand. I don’t have to remind you to be careful, do I? You’ll hear a nice crunch as you move your way across the stalk. Now that the celery is flat, cut it lengthwise into about 4 long strips. Then bunch the strips together, line the edges up, and cut into desired size, making sure to make your cuts at the same interval. If the ribs are pretty narrow and tightly curved like the ones pictured above, I would skip the flattening, they will just end up breaking in half. Instead, cut the rib lengthwise in half, then slice each one in half again. This YouTube video will show you how. 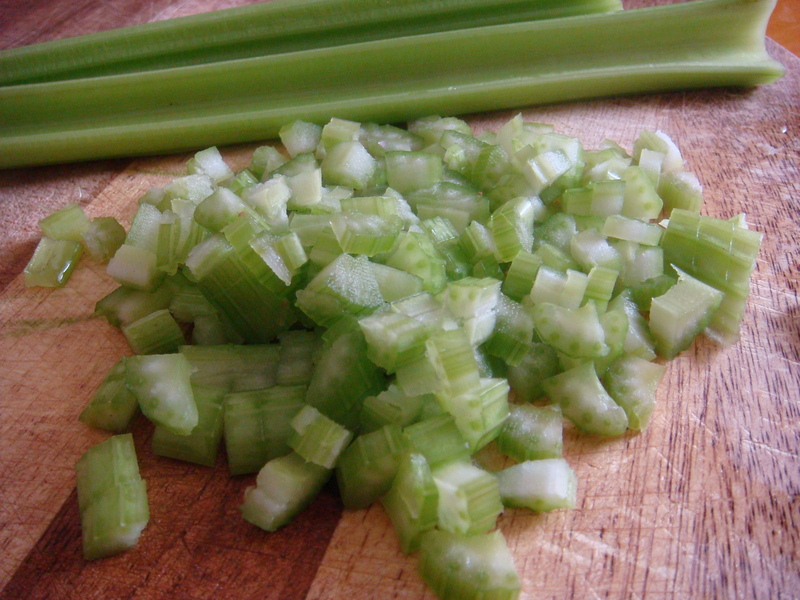 Personally, I often skip the flattening, but more than one professional chef included this flattening method when dicing celery.